I have a small collection of souvenirs collected on a shelf in my office. I they are not personal souvenirs, but a teaching collection that I use in a class I teach on the anthropology of travel: Pilgrims, Travelers, and Tourists. For this reason, I have tended to collect the most kitschy souvenirs I can find—souvenirs that scream, “I am a souvenir!” In other words, I have been collecting meta-souvenirs which reference their souvenir-ness more than the site where they were collected—objects I would never actually collect for myself. A few years ago, when in Rome I bought a small snow globe that featured the Colosseum surrounded by four other famous sites. I bought it for a few Euros because it gave me four sites in one purchase—a symbolic bargain. Spending as much time in China as I do, I immediately recognized the object’s cheap plastic casting and assembly-line paint job as that of something made in China. Indeed, affixed to the bottom of the globe was the familiar small golden oval foil sticker with the words “Made in China” printed on it. Earlier this month, while in Paris, I stopped at a small kiosk on the street by the Louvre to buy a snow globe souvenir to add to my collection. I was surprised (was I really surprised?) to find a cousin of the Roman snow globe for sale. It was a bit larger, but made from exactly the same material and painted with the same palette of paints in a similar style. Like the globe I bought in Rome, I chose a Parisian globe that included a critical mass of sights. 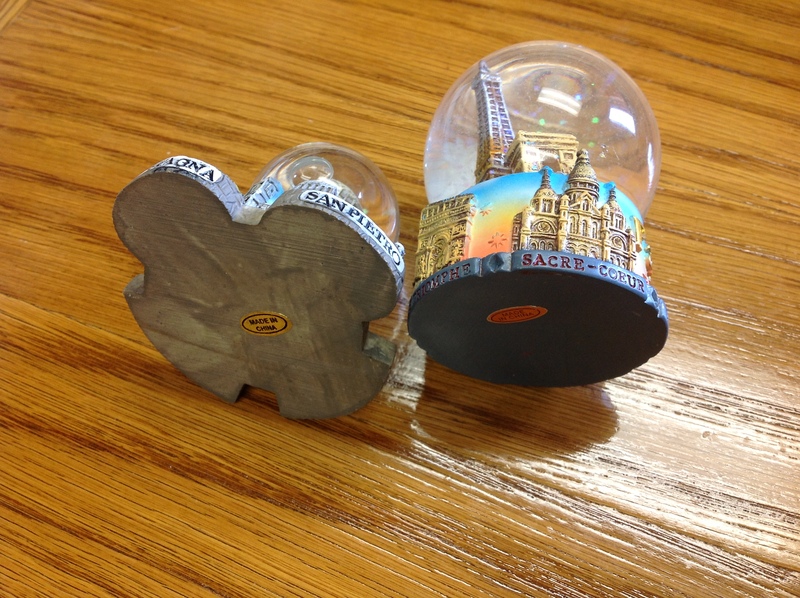 Like the Roman globe, my globe from Paris also had the familiar “Made in China” sticker on it. It might be enough to simply point out the craziness of tourist shops in both Rome and Paris selling souvenirs of their world-famous local sights produced by a factory in China. Furthermore, it is entertaining to think of Chinese tourists buying these souvenirs and then “reimporting” them to China when they return home. I wasn’t really in a position, however, to judge the situation too harshly: After all, I wasn’t even buying them as a real souvenirs—but as “souvenirs” to use in my classes! In her book, On Longing: Narratives of the Miniature, the Gigantic, the Souvenir, the Collection, Susan Stewart examines the relationship between humans and the meanings and values they ascribe to objects. Souvenirs she describes, have a metonymical relationship to the places from which they have been collected—as part of a whole that is displaced in time and space. The dis-placed object requires an explanation that relies on the traveller-collector to narrate. In this way, acquiring a souvenir inextricably links the traveler to the object: The traveler needs the object as evidence of the trip, and the object needs the traveler to explain why it is out of place. To purchase the Chinese-made globe from a tourist shop and bring it home as evidence of a European vacation is to tell only part of the story. The souvenir was already traveling when it was acquired. There is an earlier narrative of the traveling object that must erased so that the object can become a “local” souvenir. In fact, it might be precisely because they are not from Paris or Rome that through their iconography, multiple sights and colorful paint they semiologically scream so loudly they are what they claim to be! Their flamboyant topside meanings repress the simple evidence of their true global origins printed underneath. In Chinese there is a term liaoxiang (老乡) which is used to refer to someone from the same village, rural region, or home/town/place/land. When two people are in the same village they wouldn’t refer to one another as liaoxiang, but if they were to bump into one another on the streets of some foreign land they would become liaoxiang (from the same homeland). Discovering a laoxiang is a perfect moment to share stores of hometowns and the narrative of how it is that one came to be in a different place. 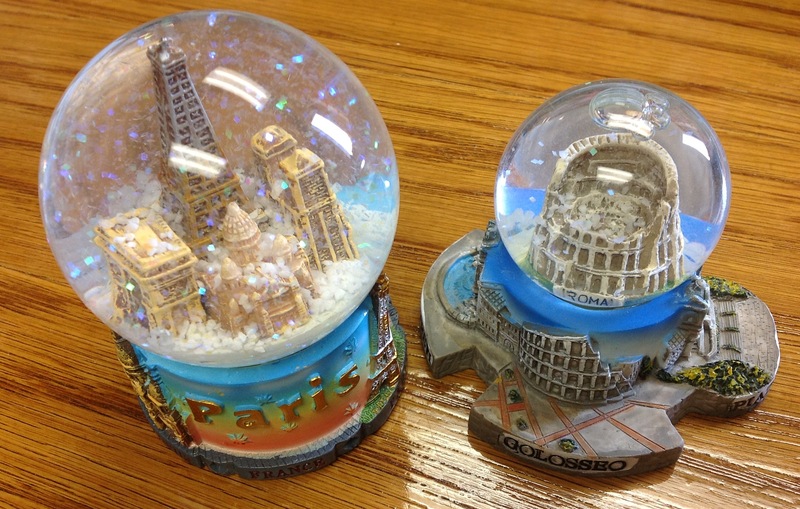 I returned home last week, unpacked my Parisian snow globe, and put it on the shelf next to its smaller Roman brother. Later that day, after turning out the lights and leaving my office, I imagined that the two globes—reunited in Saint Paul, Minnesota—greeted one another with a loud “liaoxiang!” and spent the evening sharing the stories of their different journeys from China, through Europe to America. A brother laoxiang from North Africa! Yesterday, while in the Mohammed V International Airport in Casablanca waiting to fly home, I spotted some snow globes for sale in the duty free shop. I hadn’t seen these for sale anywhere in the tourist stores of Fes, Marrakech or the other cities we visited, so it was a nice surprise. Because of the liquid restrictions for carry on bags, I had to buy the smallest one. 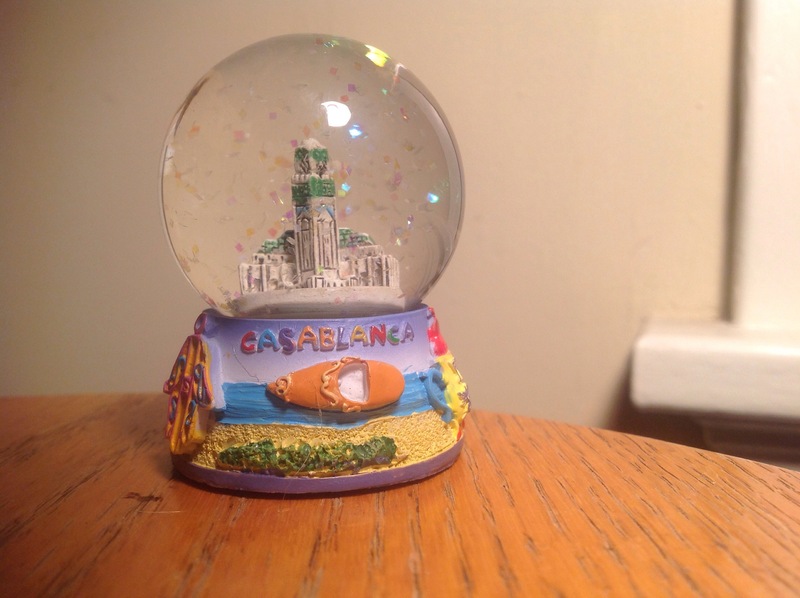 It is about two inches high and features a beautiful plastic replica of a mosque inside and multicolored snow—not that it ever snows in Casablanca. Around the base of the globe are some of the tourist symbols of Morocco—a teapot, a man in robes with a fes, a tagine, a beach with palms, a hand of fatima, and a pair of pointed babouche slippers. The sicker on the bottom covered any trace of a “Made in China” sticker, if one should exist. The manufacturing quality, materials, and style, however are consistent with the globes from Paris and Rome. I’m pretty sure that I have acquired a globe from Casablanca that will be right at home next to its long lost brothers on the shelf in my office. It was interesting for me to observe on the Pearl Harbour Memorial site that more than 90% of the souvenirs in the souvenir shops were made in China, with the exception of the U.S. flags that had been hoisted on the USS Oklahoma and are sold after having been in the air for one day. Pointing out that so many souvenirs bearing the stars and stripes are manufactured in China to the US tourists was a shock to some of them,… but I guess that is globalization…. This seems to be the case nearly everywhere. On one level it is globalization—or at least the result of it. However, it seems there is more to this than just cheap stuff made in China shipped to a tourist site to sell for a profit. There is a disconnect at the level of the consumer about the value of where something comes from. The objects don’t need to be materially related to the location whatsoever. It seems they just need to have a symbolic likeness and be purchased at the site. It can be the smallest piece of plastic crap, but if it looks like the Eiffel Tower and was purchased in Paris then that appears to be enough. I’m just pondering the point of this blog. Please don’t take my first sentence critically. There’s a lot of thought provoking substance. For instance, I wonder how many jobs are created/maintained with the creation of a product in a foreign market, the import/export of said product into the shops all around our country. Compare that to one single person creating the product (even within walking distance of the place it’s sold). It would still be more expensive because we value our time differently than others. Therefore, I almost get a sense of selfishness, however small, if we still paid the premium price of locally made/produced souvenir. I enjoy looking at my souvenirs moreso after reading this blog. I know this is just a tangent but I wanted to share my thoughts. Thanks for your feedback. Actually the point of this post was to consider the many different things going on–the many meanings–in such a simple object. People buy a souvenir as a memento of a place, but in this case the thing has no direct relationship to the place, other than a superficial claim. Even though they are made in China–perhaps even in the same province–tourists consider them “of Rome” or “of Paris.” I’m glad you enjoyed it.